1. Cruise control / speed limiter controls. 2. 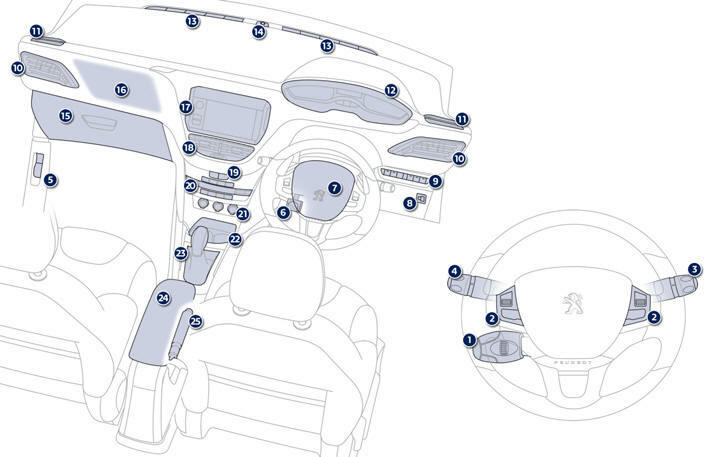 Steering mounted controls for the touch screen. 3. Wiper / screenwash / trip computer stalk. 6. Steering wheel adjustment control. 19. Central locking and hazard warning buttons. 20. Heating / air conditioning controls. 21. 12 V accessory socket. USB port / auxiliary socket. Additional USB port. 22. Open storage. Cup holder. 24. Central armrest with storage.